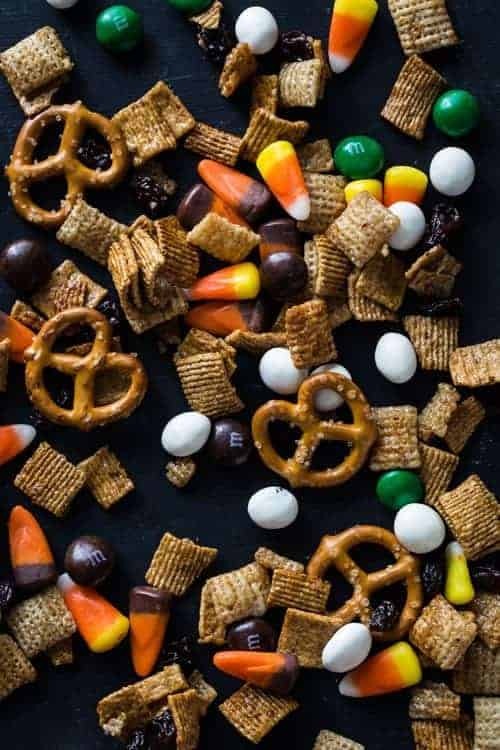 Pumpkin Spice Chex Mix is loaded with sweet and spicy coated cereal, pretzels, yogurt raisins, and candy corn. It’s perfect for a party or game day snacking! So, Halloween is over and if you’re at all like me you’ve got gobs of candy corn sitting around. I honestly have no idea why I hoard the stuff every single year and rarely do I actually eat it. It’s not that I don’t like candy corn, it’s just that there are far superior Fall candies to be had. Hello, Pumpkin Reese’s – can someone please explain to me why these are so much better than a regular Reese’s Cup? I’m thinking it’s the peanut butter to chocolate ratio, but that’s just me. I may or may not have picked up a couple of bags of them on clearance for 50% off and hid them from myself in the freezer. Who am I kidding? They’re so not hidden, they’re just frozen – exactly the way I like ’em! It’s no surprise that my favorite ingredient for fall baking is homemade pumpkin pie spice. If you frequent MBA during the holiday season, you know it winds up in allthethings. 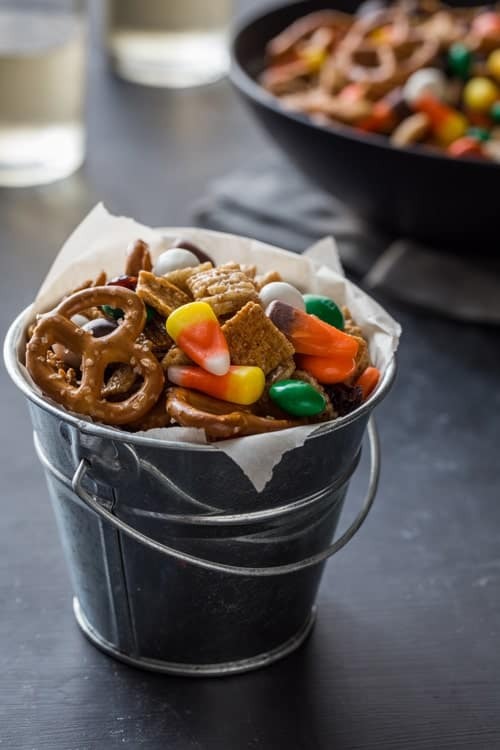 And fall snack mix is no exception. Pumpkin Spice Chex Party Mix is pretty much the result of having a pantry snack cabinet bulging at the seams. Seriously, who needs 3 types of pretzels? And don’t even get me starting on the flavor varieties of yogurt covered raisins and cereals. I’m fairly certain that Eric has a legit cereal addiction that I’m only just now realizing exists. This stuff is fantastic for serving in your game day spread. Put some out in little bowls, scattered around your living room. Everyone will be snack-happy as they watch the Browns win (hey, they’re doing pretty darn good!) and Peyton-what’s-his-name yell “Omaha!”, whatever that’s about. I never claimed to understand football. I’m just here for the snacks. 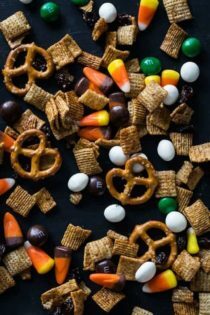 Pumpkin Spice Chex Mix couldn’t be easier and it’s incredibly adaptable, so you can just use what you have on hand. And it’s a great way to use up some of that candy corn – just sayin’. 2. In a large bowl, stir together cereals, pretzels and raisins. If you'd like to add nuts to this Chex mix, add them at this time. 3. In a medium bowl, whisk together the melted butter, honey and pumpkin pie spice. Pour butter mixture over cereal mixture and stir to evenly coat the cereal, pretzels and raisins. Spread mixture onto a large baking sheet and bake in preheated oven for 12-15 minutes, stirring twice during the baking process. Allow the Pumpkin Spice Chex Mix to cool for one hour. Stir in yogurt covered raisins, M&Ms, and candy corn. Pumpkin Spice Chex Mix will store in an airtight container for several days. I’m loving this chex mix, Jamie! You’ve incorporated so many great components. The yogurt covered raisins and m&m’s are my favorite part. Is it a party foul if I pick those out to eat first? Thanks so much, Jen! It’s definitely addictive! My family is addicted to these cereal snack mixes! I did learn one thing NOT to put in the mix: marshmallows. The grocery had orange and white ghost-shaped marshmallows at Halloween, so I added those to my mix. It made all the crispy stuff (pretzels, cereal) stale. I know it was the marshmallows because I saved a small bowl to keep at home before I added the marshmallows, and that batch wasn’t stale. So no marshmallows, not even the cute ones! It’s so true. 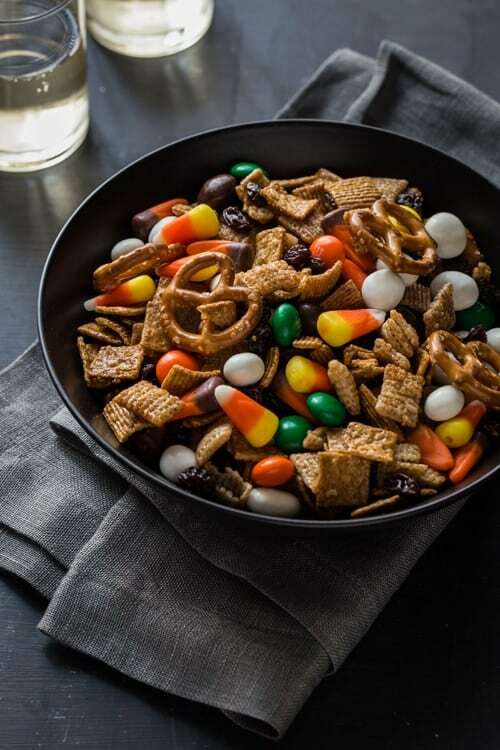 Reeses Pumpkin’s (and eggs) are superior over regular Reeses, which I once thought would be impossible ;) This chex mix looks great…I’m particularly excited about those golden grahams…can’t remember the last time I’ve had those! Golden Grahams are amazing, Jennifer – one of my faves! Thanks so much for stopping by!